Nestled in the foothills of the Blue Ridge Mountains, the city of Charlottesville thrives amidst numerous tangible reminders of an incredibly rich history. Founded in 1762, the heart of early Charlottesville was the stage for some of the most important figures in early American history, including Thomas Jefferson, James Madison, and James Monroe. Growing side by side with Jefferson's University of Virginia, Charlottesville developed into a bustling community whose businesses, families, and celebrations were well documented in photographs beginning in the 1880s. 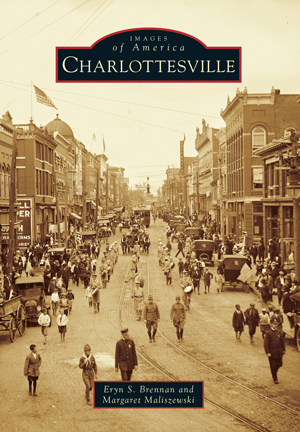 The collection of images reproduced in Images of America: Charlottesville tells the story of the creation, growth, hardship, transformation, and success of a city beloved by residents and visitors alike. Eryn S. Brennan holds a master's degree in architectural history with a joint certificate in historic preservation and a master's degree in urban and environmental planning from the University of Virginia. She has been an active preservationist and architectural historian for over 10 years. Margaret Maliszewski also holds a master's degree in architectural history and a certificate in historic preservation from the University of Virginia. She has worked as a historic preservation planner for over 20 years and is the author of Architecture and Ornament: An Illustrated Dictionary. Both authors live in Charlottesville.